By using the Migration Manager, you can migrate configuration content from one production environment to another. The typical use is to migrate configuration content from a development environment to a test environment and then on to production for the Tivoli® process automation engine and its applications, such as IBM® SmartCloud® Control Desk. The goal of migration is to ensure that your production environment fully meets the needs of your users. 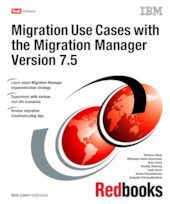 This IBM Redbooks® publication is an update of the existing book Migration Use Cases with the Migration Manager, SG24-7906 and covers the most common migration use cases with the Migration Manager, including the capabilities that were introduced with Tivoli's process automation engine V7.5. These use cases are only a small subset of the possible migration scenarios that can be performed by the Migration Manager, but they were chosen to be representative of the capabilities of the Migration Manager. In addition to these use cases, the book presents a migration strategy and a comprehensive chapter about troubleshooting possible migration problems when the Migration Manager is used. We strongly suggest that you read Chapter 1, "Migration strategy" on page 1 first before reading the other chapters. This chapter give syou a good foundation for all of the migration scenarios that are covered in the book. This book is a reference for IT Specialists and IT Architects working on migrating configuration content from one production environment to another by using the Migration Manager.